Matrix interference is often the bottleneck in achieving low limits of detection (LOD) when the sample compounds are in complex matrices such as in the analysis of pesticides in various agricultural products. As a result, advanced ways of selectivity enhancement for the reduction of matrix interference were developed, such as MS-MS and high resolution MS. In MS-MS, the selected parent ions undergo collision induced dissociation and one or two daughter ions are transmitted and detected in the third quadrupole MS. We estimate that MS-MS involves with a signal loss of about a factor of 10 while the matrix signal is reduced by an average factor of 200 thereby the selectivity against matrix interference is improved by a factor of about 20. In high resolution MS the selectivity gain is about the resolution/1000 while for compounds with negative mass defects such as dioxins and other multi halogen compounds it can be much higher. Nevertheless, high resolution MS also suffers from reduced signal compared to single ion monitoring with a simple single quadrupole MS instrument. The topics of selectivity gain in MS-MS and high resolution MS will be separately discussed in future blog posts. In this post we wish to illuminate another option to reduce matrix interference which is the use of Cold EI (EI of cold molecules in Supersonic Molecular Beams (SMB)) with its enhanced molecular ions, and compare it with MS-MS. It is known that matrix interference is reduced with mass. We found that the matrix interference reduction factor is about twenty per one hundred amu higher mass. (M. Kochman, A. Gordin, P. Goldshlag, S. J. Lehotay and A. Amirav "Fast, High Sensitivity, Multi-Pesticide Analysis of Complex Mixtures with the Supersonic GC-MS" J. Chromatogr. A. 974, 185-212 (2002)). Thus, the molecular ion is by far the most selective ion in the EI mass spectrum against matrix interference. As a result, we claim that SIM on the enhanced molecular ion in Cold EI is about as selective against matrix interference as MS-MS on a fragment ion as a parent ion. Since most pesticides are analyzed by MS-MS with standard EI on their major fragment ions as parent MS-MS ions (since their molecular ions are weak or absent), we claim that the Aviv Analytical 5975-SMB GC-MS with Cold EI is as selective as GC-MS-MS with standard EI. Keep reading to find out how the Aviv Analytical 5975-SMB GC-MS with Cold EI enables significant reduction in matrix interference while unlike MS-MS it further enables simultaneous full scan and SIM analysis for achieving universal pesticide screening. The use of time programmed SIM has a very important advantage over MS-MS in that it enables simultaneous full scan for obtaining universal pesticides analysis with minimized false negatives via RSIM on the molecular ions of unlimited large group of pesticides. We note that suitable software for such multi RSIMs data analysis is included with the Agilent Chemstation software and an improved version of it is the Agilent DRS software. While SIM can be operated simultaneously with full scan, in contrast, MS-MS can not be operated simultaneously with full scan since the time required to remove the CID gas in Q2 is too long, and as a result, MS-MS must be operated as a target compounds oriented method. An estimated 2000 chemicals are being used or banned for use as pesticides worldwide and such large number of compounds can not be screened by MS-MS. Thus, universal non-target based pesticides screening system and method is needed with an emphasis via time programmed SIM on those that are widely used. Furthermore, universal pesticide screening requires a system that is compatible with the analysis of extended range of pesticides or other hazardous target compounds to include many of those pesticides that are difficult for GC-MS analysis or that currently require LC-MS for their analysis. The above statements should not imply that MS-MS is not useful, it is very useful and can serve to confirm pesticide findings to further remove false positives. In any case pesticides are also analyzed by LC-MS, thus GC-MS findings can be confirmed by LC-MS-MS while the LC-MS findings should be confirmed by a GC-MS that can analyze extended range of pesticides. The selectivity of GC-MS can be improved by the use of Cold EI, MS-MS or high resolution MS, and any of their combination can further excel in the removal of matrix interference. Clearly, the combination of high resolution TOF with Cold EI can provide the ultimate selectivity in universal full scan mode while the combination of MS-MS, HR-TOF (such as in QTOF) and Cold EI can provide unprecedented selectivity for target compounds. We explored the use of the Aviv Analytical 5975-SMB GC-MS with Cold EI for the development of a new universal pesticide analysis method that will be described in the next blog post. Briefly, while the use of Cold EI (EI of cold molecules in Supersonic Molecular Beams) results in enhanced molecular ions, the use of short columns and high column flow rates such as 8 ml/min lowers pesticides elution temperatures by over 100ºC, thereby enabling the elution of the usual as well as the "difficult" and thermally labile "LC pesticides", combined with the provision of enhanced molecular ions and fast analysis with under 10 minutes chromatography time. In Figures 1 and 2 the significant reduction of matrix interference with mass is demonstrated via the few reconstructed mass chromatograms of diazinon and tulylfluanid that were analyzed at 80 ng/g concentrations in strawberries. As clearly shown, the molecular ion mass chromatograms are fully clean from any matrix interference while the RSIM traces of the fragment mass spectral peaks are contaminated, and the degree of matrix interference is strongly increased as the fragment mass is reduced. This clear observation (which is further discussed with additional examples in the literature reference given in the introduction) serves as the foundation for our claim that SIM on the molecular ion with Cold EI is as effective in the removal of matrix interference as MS-MS on a fragment ion with standard EI. Figure 1. 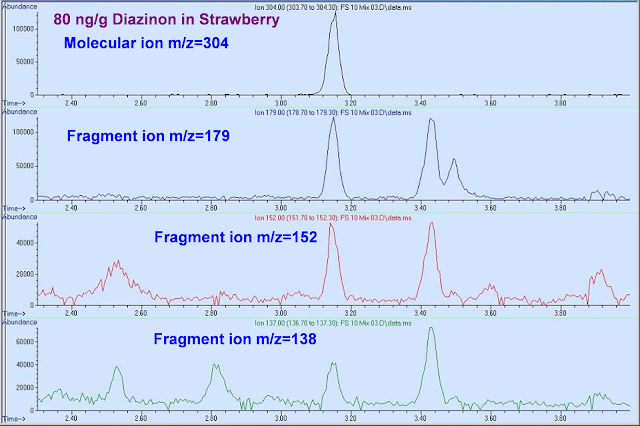 Reconstructed mass chromatograms of diazinon at 80 ng/g concentration in strawberries. As demonstrated, the molecular ion mass chromatogram is fully clean from any matrix interference while the RSIM traces of the diazinon's major fragment mass spectral peaks are contaminated. Figure 2. 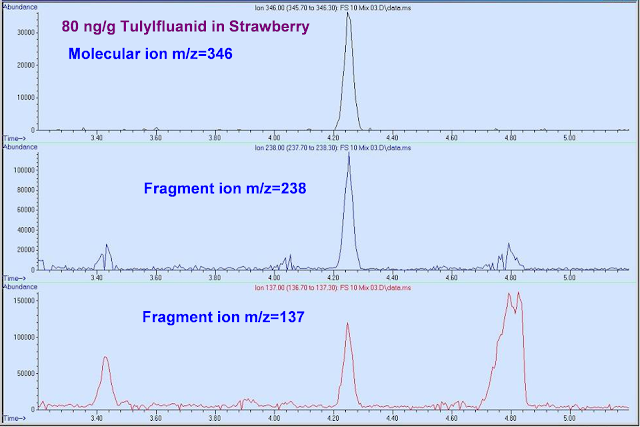 Reconstructed mass chromatograms of tulylfluanid at 80 ng/g concentration in strawberries. As demonstrated, the molecular ion mass chromatogram is fully clean from any matrix interference while the RSIM traces of the pesticide's (tulylfluanid) major fragment mass spectral peaks are contaminated. We note that the instrumental SIM sensitivity is superior to that of MS-MS since the later suffers from four types of signal losses compared to a single quadrupole MS: 1) Q3 transmission losses of a factor of 3-4 at standard tune resolution; 2) CID losses via dissociation to a few ion masses which is about x3 loss factor but sometimes much higher; 3) Q2 losses due to ineffective retaining of fast fragment ions; 4) Q2 collimation losses at the Q2 entrance and exit lenses which do not exist in a single quadruple instrument (about x2-4). In total, MS-MS suffers from about an order of magnitude lower daughter ion signal than SIM on the parent ion. Another important related topic in pesticide analysis is pesticide identification. Since we wish to retain the superior selectivity of the molecular ion, our approach is to identify the pesticides in their time programmed SIM screening via isotope abundance analysis (IAA) on the molecular ions and their isotopomers (the same molecule with different isotopic composition). Thus, the SIM selected ions per pesticide are the molecular ion and another abundant molecular ion isotopomers (M+1 for example for 2 ions SIM) followed by the analysis of the isotopomers intensity ratio (isotope abundance analysis (IAA)) with our Tal-Aviv Molecule Identifier software. Unlike other methods, IAA provides objective, machine generated matching factors which if above 800 (when 1000 is a perfect match) can serve for pesticide identification in addition to the pesticide elution times, co-elution of the molecular ion and its isotopomer and attempted library identification via the simultaneous full scan. This identification procedure is in analogy to MS-MS on two daughter ions. Since the molecular ion is by far the most compound characteristic ion in the MS, sample identification via the molecular ion, its isotopomer and a stringent requirement on their intensity ratio is superior to the Sphon's method of three ions when these three ions do not include the molecular ion as is often the case with standard EI. We discussed and demonstrated that SIM on enhanced molecular ions with Cold EI is as effective in the removal of matrix interference as MS-MS on fragment ions with standard EI. Since most pesticides are analyzed by MS-MS on their major fragment ions as parent MS-MS ions in standard EI, we claim that the 5975-SMB GC-MS with Cold EI is as selective as GC-MS-MS with standard EI. Another way to express this opinion is that MS-MS on a fragment ion as a parent ion serves well to remove matrix interference which, to begin with, is absent on the molecular ion. Thus, if the molecular ion is exhibited it can serve well to significantly reduce matrix interference. In fact, the correctness of our claims can be tested with your standard EI files in which we predict that the molecular ion RSIM traces will show minimal matrix interference, and now imagine the situation if the molecular ions is enhanced. You can also use the criterion of enhanced selectivity factor of twenty per 100 amu mass increase in order to calculate if the selection of a lower abundance molecular ion should be preferred over the selection of a more abundant fragment ion in MS-MS or for the method of three ions time programmed SIM analysis. The road is now open to develop the much needed method of truly universal pesticide analysis in complex agricultural products matrices which will be the subject of our next week blog post.